Today we get to hear from Jessica of Happy Together! Jessica is currently expecting their second child and will shortly find out if they are adding another sweet girl or mixing it up with a boy! 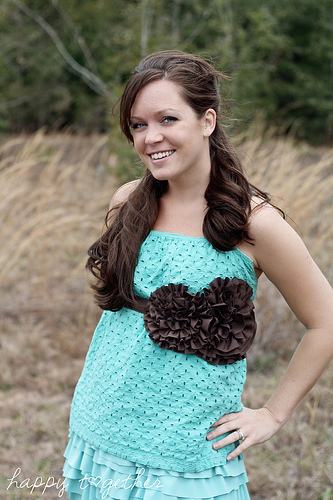 Jessica's blog is filled to the brim with tutorials, many of which are repurposed, like the cute maternity top she's wearing inspired by modcloth. 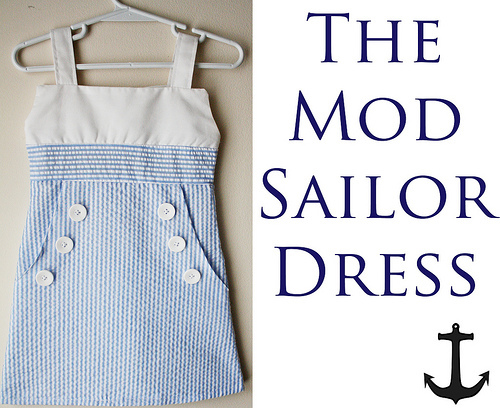 A couple of my favorites are the Military Dress and the Mod Sailor Dress. Aren't they adorable? 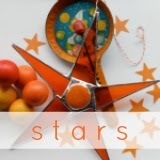 In addition to her blog tutorials, Jessica has a shop full of patterns. I tell you, that girl is a never ending source of creativity! 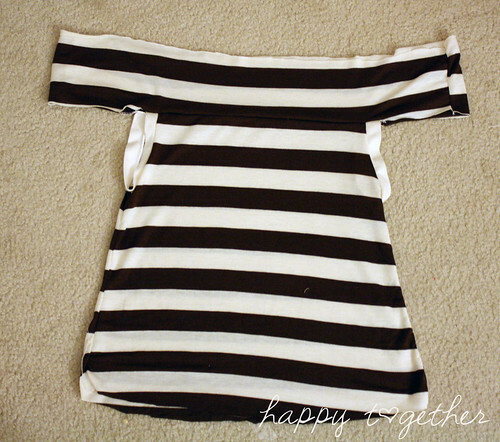 I'm loving the striped number she came up with us for today, which also includes her quick and easy how-to! Curious is defined as "Marked by desire to investigate and learn." Everyone is curious about something at one time or another. It could be an actual thing, an idea, a person. 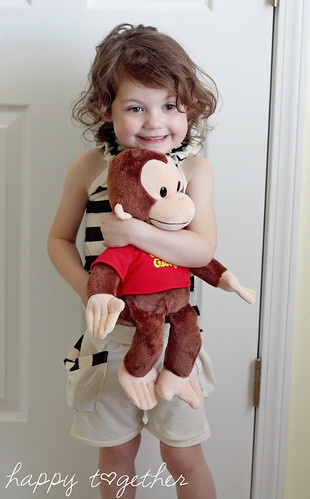 Curious George seems to be curious about everything (hence the name). 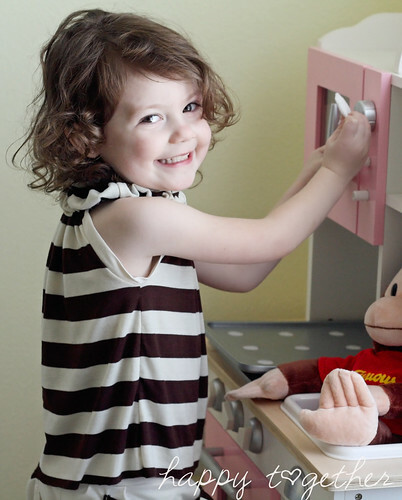 It only makes sense that my curious daughter takes a liking to the little guy. She's also very curious. Oh the things she has gotten into! Especially when no one is around. It makes for an exciting time for sure. 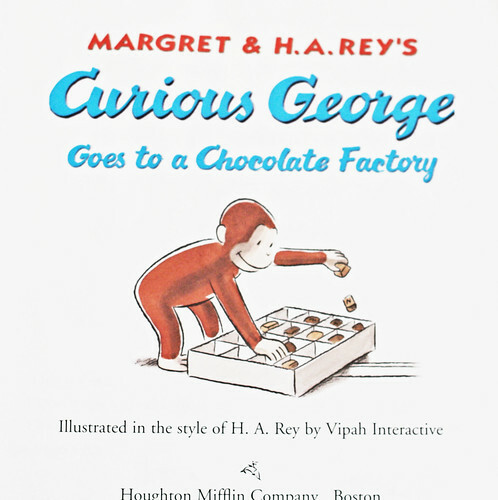 One of her favorite Curious George stories is when he goes to visit a chocolate factory. I think she is imagining herself being in a chocolate factory, with no one paying her any attention. 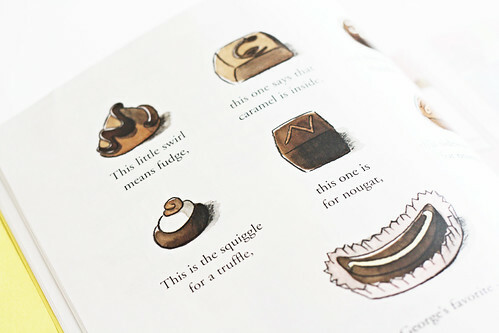 She shares George's love for the taste of chocolate for sure. She will remember where any is stashed right when she wakes up and devise a plan to get her hands on some. I have walked in many a times to her having pulled up a chair to the counter, standing on her tippy toes (on the counter), searching for leftover candy. So for an chocolate outfit, I wanted it to be chocolate colors and also have some big pockets for her to stash her "chocolates" in. 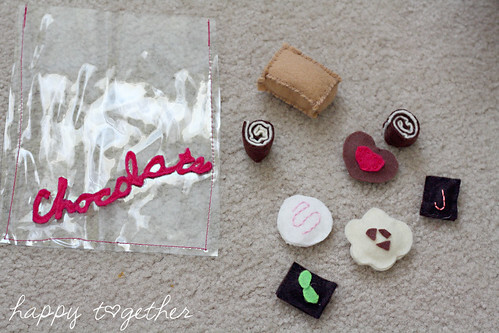 I decided some felt chocolates would be a better choice for her to have, so we made some of those too. 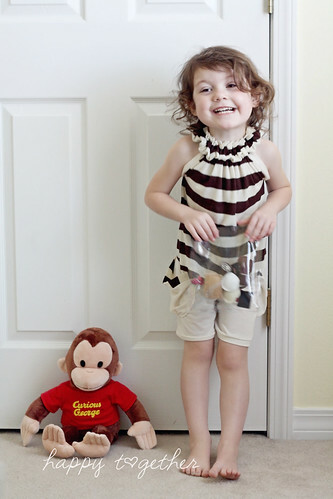 They are a big hit and I don't get a sugar monster after wards ;) The outfit is also a hit with her. I really need to make her more things with pockets. I grabbed some knit fabric and laid a shirt on it for a general sizing reference. 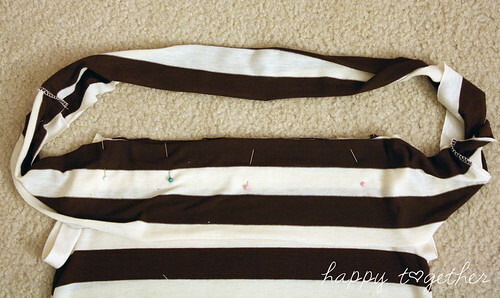 Make sure the stretch of the fabric goes horizontally (side to side, not up and down). 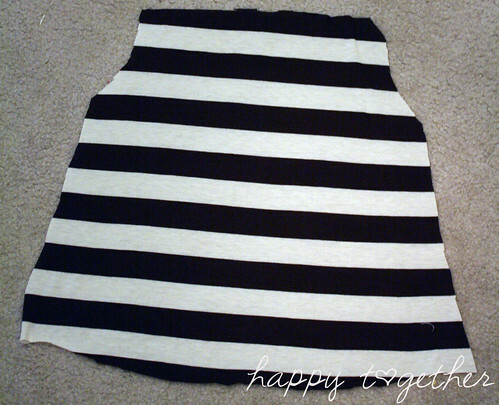 Then cut out two pieces that kind of have a tank top look. 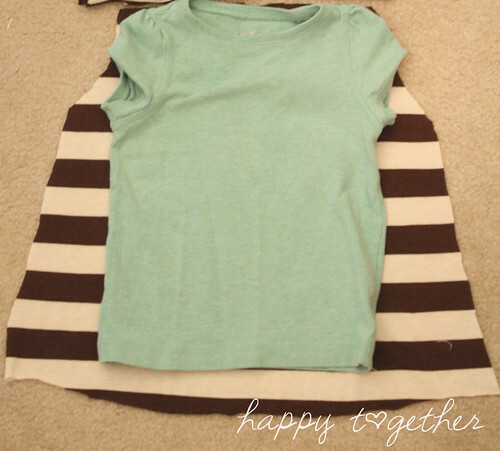 Place the two pieces together, right sides facing, and sew the sides underneath the armpits together. Remember to use a needle meant for knit fabric! 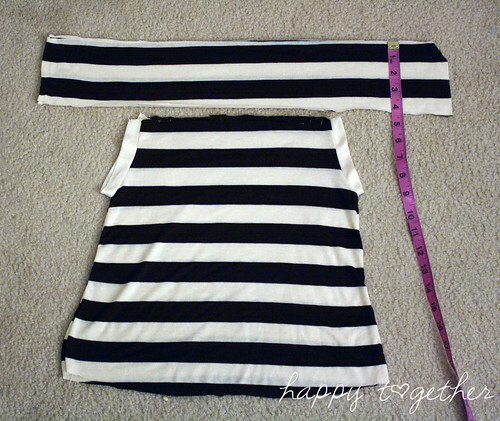 Then, if you like, you can cut some long strips to cover the armholes. I just did mine at 2 inches wide and long enough to go around the armhole. Iron each armhole piece in half and pin in place, with raw edges touching. Sew in place. Now cut two more pieces that are double the length of the shirt top and about 4 inches wide (or smaller if you want the neck piece to be thinner). 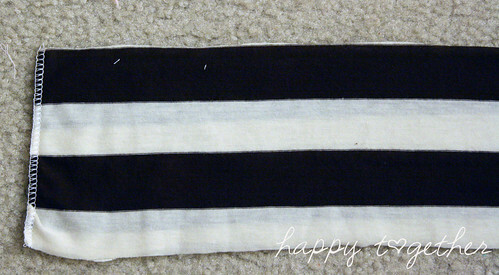 Place the two pieces together, right sides facing, and sew the short sides together on each end. Now you will have a tube. 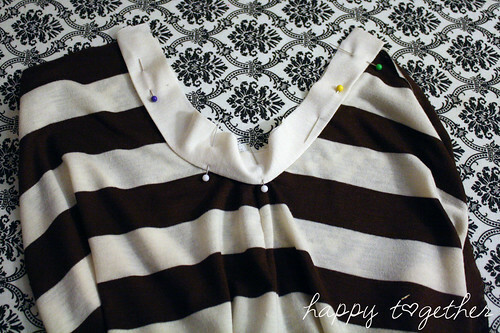 Pin the middle of one side to the front shirt, making sure the right sides of the fabric are facing. Sew in place. Repeat for the back side. Now it will look like the picture below. Then shirr two rows on the top tube pieces, one 1/2" inch from the top and one 1/4"-1/2" from the bottom. Then you are all done. No need to finish the edges unless you want to. Off to grab some chocolate and get sewing! Thank you, Jessica for visiting and sharing today! Is this missing the final instruction on gathering the top? Fun! I love the colors and the pockets. 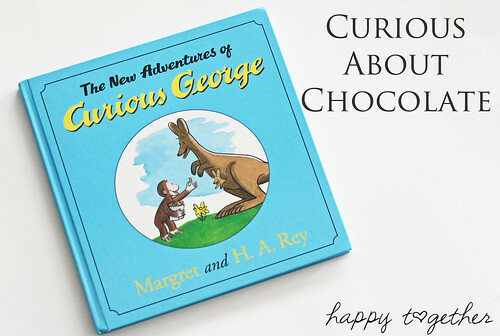 My daughter is also obsessed with Curious George and chocolates. Hashi-She says "to shirr two row on the top tube pieces, one 1/2" from the top and one 1/4"-1/2" from the bottom." You can create shirring by using elastic thread in your bobbin and then sewing once or twice along the bottom and top of the tube. You could also zig zag stitch with elastic on the wrong side, pulling it as you go so it gathers. Darling top...love it! Gonna have to try soon :) Thanks! This will be the perfect summer top for my little girl! Thanks for the how-to! What a creative and beautiful top! I love it! It´s on my To-Do-List now. A good summer top. Brilliant and simple! This will be added to my list of summer clothes for my two Girls! that top is adorable. I think I will try it as a dress! 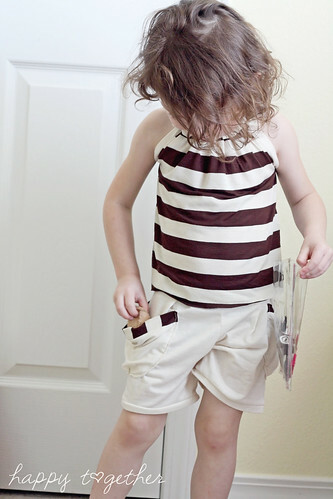 totally agree pockets are a must have for little girls how else can they carry around their sugar and spice? Thanks for having me :) It was an honor! Hi.. thanks for the tutorial. I have made one (following the chocolate outfit) for our retro 60s night. You can check out my blog http://miaach.blogspot.com/2011/04/retro-60s-dress.html.